Investigate the Argonian refugees in the Gray Mire. The Gray Mire — Investigate the Argonian tribe's intentions. Dominion soldiers erected barricades around a tribe of Argonian refugees living in the Gray Mire. Officer Parwinel needs help resolving the Argonians' situation. Convince Slim-Jah, No-Fingers and Uta-Tei to talk to you. Find and kill hunters along the shore. Talk to No-Fingers outside of the sea cave. Kill the enemies inside the sea cave. Talk to No-Fingers in the Gray Mire. Speak to Officer Parwinel in her tent south of the Gray Mire Wayshrine. "Are you here about the refugees? I've already explained this to the three inspectors from Elden Root. 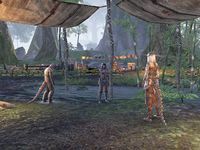 Until their status is resolved, the Argonians are to remain within the enclosure." Argonians? What's going on here? "Praise Y'ffre, someone who isn't going on about Argonian spies! Last year, this tribe arrived in Grahtwood as refugees. But because we're all part of the Dominion now, my superiors can't decide what to do with them." Could they be spying on the Dominion? "Absolutely not. This entire tribe was enslaved by Dark Elves. They have more reason to hate the Ebonheart Pact than either you or I. "But someone in Elden Root decides to set an example, and now there are barricades. It's why I need outside help." "Here's a list of the tribe's leaders. I need to know why they refuse to speak with us. Unless my report says they're cooperating, my superiors have an excuse to exile them." I'll see what I can learn. "Soldiers and barricades aren't exactly a welcoming feast. But unless the Argonians are willing to speak with us, they won't stay in Grahtwood much longer." The quest begins after you ask the next question. What can you tell me of the tribe's leaders? "Uta-Tei is some kind of spiritual leader. Friendly sort. Slim-Jah fishes for a living, with eyes as cold and dead as her catches. "As for No-Fingers? I have no idea what he does, but the tribe respects him." Uta-Tei is praying next to a reddish-orange banner with black symbols on it. "Welcome. What brings you to the Gray Mire?" "Then you're a wandering soul, much like our tribe was? Without the gracious Wood Elves, we would still roam Tamriel in search of a new home. "Once the Dominion understands the depth of our gratitude, I'm certain they'll remove the barricades." You can choose to ask her about the Dominion, how the tribe came to Grahtwood and her role in the tribe. What do you think of the Dominion? "The Dominion capital is the Wood Elf city of Elden Root. The bulk of its armies are Wood Elf soldiers. I see no difference between the Dominion and our Wood Elf benefactors." What about the barricades around your village? "The tribe's leadership will soon meet to discuss this matter. Some fear the Dominion plan to enslave us, as the Dark Elves once did. I hope to put this absurdity to rest. "You're welcome to attend the meeting, wanderer. We have nothing to hide." How did your tribe end up in Grahtwood? "We were slaves to the Dark Elves for generations. When the Ebonheart Pact formed, we refused to fight alongside our former captors. They called us traitors and banished us from our lands. "We roamed Tamriel for years, and only stopped when we reached Grahtwood." Why did you settle here? "We asked the Wood Elves here for temporary shelter. Instead, they gave us the Gray Mire! All they asked was that we work the land and set aside some of our fish. "For this, we must always be grateful." What is your role in this tribe? "In Black Marsh I was a tree-minder. I tended the Hist, the great trees of our people. "Here I will become a spinner, to speak with the trees of Grahtwood. I will lead my people to Y'ffre, the Wood Elf god of the forest." Why do you want to become a spinner? "We've always thought that without the Hist, there can be no hatchlings. But with Y'ffre's guidance, I will find a way. "Think of it. Argonians native to Grahtwood, to our new way of life. Proud citizens of the Dominion which Queen Ayrenn hopes to build." You need to wake up No-Fingers to talk to him. There is a bucket of water east of him. Next to it is an Argonian Refugee's Diary. Throw the bucket of water on No-Fingers. "I was dreaming of speckled fish. Now I'm hungry and wet. Explain yourself." "Despite what you may have heard, a bucket of water to the face isn't a traditional Argonian greeting. "But I'm not one to stand on ceremony. What's on your mind?" You can ask him about the Dominion, his name and his role in the tribe. "As long as I can raise my guar and sleep in the shade, I don't care who rules this land. We want to live in peace, as a free people. If the Dominion supports us, then I support the Dominion." What if they don't support you? "I'd find somewhere else to sleep in the shade. "Some of the rough skins in this village might not see it the same way. I wouldn't go throwing buckets of water on them. You might lose a finger." "The meeting! I nearly slept through it. Uta-Tei wants to discuss the grumbling about the barricades. "You should come, see how we govern ourselves." Slim-Jah is sitting in a chair at the south end of the Argonian camp. "Begone, outsider. You have no place here." "I speak with warriors, not spoiled eggs." You can demonstrate your skill in battle for her, or if you have the persuasion perk, persuade her to talk to you. Are you asking me to fight you? "If I wanted you dead, I wouldn't ask. "Show me what kind of warrior you are. If you survive a duel with one of my hunters, I'll answer your questions." To duel the hunter, go up to one of the hunters around Slim-Jah and ask them to duel. "Go on then, ask what you will." "I hunt and I fish. I do it better than the rest. The others respect my strength. "This tribe has forgotten how to survive. You want to know my role? I remind them what we left behind." "No matter how far this tribe wanders, they will always bathe Elven boots with their tongues. Dark Elves, High Elves…a Nord with pointed ears would do. "But some of us fought our slavemasters. When they forget, I remind them." You think the Dominion are slavemasters? "By Dominion you mean Queen Ayrenn. She's like any Dark Elf matron, but her lash is an army of Thalmor lackeys. "The Wood Elves and Khajiit are the worst kind of slaves. They'll pave her road to victory with their own blood, and thank her for the privilege." So you aren't in favor of the Dominion? "Enough questions. Uta-Tei called a meeting to discuss the barricades. "If you're so eager to learn my thoughts, you should attend." At the meeting, Slim-Jah is reluctant to work with the Dominion. When Uta-Tei says Y'ffre can give the tribe hatchlings, Slim-Jah kills her for her heresy. She says "Hail, Sithis," and disappears in a cloud of smoke. No-Fingers says Slim-Jah was once a Shadowscale. He gives you Comes-When-Called, a guar, to help you defeat Slim-Jah's hunters. You search the Far Beach, the Breakpoint, the Backshore, and the Foreshore for hunters. No-Fingers is outside of the Sea Cave, west of the Foreshore. He says Slim-Jah is trying to control Mother Lightning, a giant wamasu. No-Fingers reveals that he, too, was once a Shadowscale. You and Eager-Teeth, another guar, enter the cave and kill Slim-Jah. Talk to No-Fingers back in the Gray Mire. He wants you to lie to Officer Parwinel about what happened to Slim-Jah and Uta-Tei. You can tell her some Argonians planned to attack the Dominion, or lie and say it was just the hunters sparring. If you lie to her, she will ask where the two missing leaders are. You will have to lie again, telling her they probably went deep-sea fishing on a boat. You tell her the tribe is not a threat to the Dominion. She gives you a reward.